Arsenal was able to bounce back from last week defeat against Chelsea with a 5-2 win against high-flying Leicester, who was unbeaten before this match. The scoreline suggests a goal feast which was resulted from a very open game from both teams. Alexis Sanchez scored his first hat trick in Arsenal shirt, sandwiched from Walcott's equalizer and Giroud's injury time goal. There are few take out from this matches. 1. Arsenal's Goal-scoring ability Finally Arsenal scored a lot of goals! Arsenal only scored five goals from previous six league games, and despite the ability to create chances, we were unable to score more goals. From this game we can see that the Gunners' counter-attack ability is quite fearsome. With Walcott and Alexis supported by Cazorla and Ozil behind them, we scored four goals from well-crafted counter attack. A good sign that they have gelled together? They would still need to provide this kind of attack more consistently. We can't win the league with only scoring like this once a while. Walcott played much better than the Chelsea games as he got a lot of spaces due to Leicester high line, while Olivier Giroud missed another a great chance to mark his stamp on the line-up after coming in on the second half, but at least a goal under his name will undoubtedly boost his confidence. Alexis who started scoring might be seeing more goals in the future. Hope his hattrick would be the start of his goals collection! 2. Second half improvement.In the second half Arsenal played much better and was able to dominate the game to score three more goals. In the first half, Leicester was arguably the better team of the two sides, they scored once and denied twice by the crossbar. Strangely though, Shinji Okazaki was subbed off on the second half and that contributed to Arsenal's dominance in the second half. 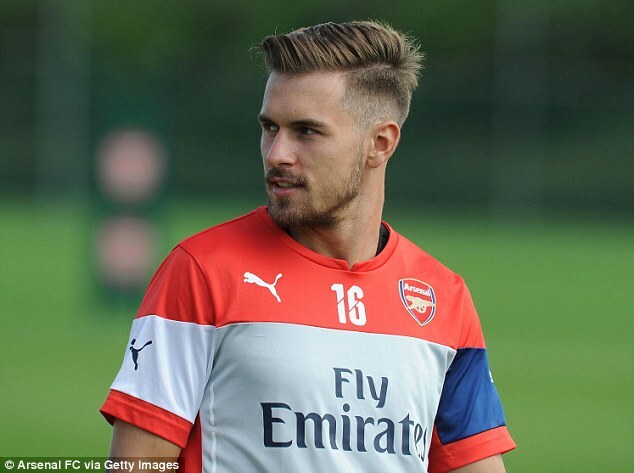 Furthermore, we can see the importance of Aaron Ramsey on the side. Despite being criticized of not doing well on the right flank, he provides the stability on the team. He could run, tackle, and not losing the ball as compared to Chamberlain, who has more flair. Ramsey covered a lot of areas today and backed Bellerin on the flank. It's been a long time since Arsenal played without Coquelin in the League. In this match we can see his effect on Arsenal's rigidity. Flamini could not provide the same coverage with Coquelin as we saw Leicester players bypassing Arsenal defence and dominating in the first half. Only when Arsenal settled their game, our defence looks better as we controlled the flow of the game. Another thing is the leaky defence, despite the return of Per Mertesacker. Arsenal's defence was quite shaky to defend a pacey striker today. Next week a tougher game is waiting for the Gunners. League topper Manchester United is coming to Emirates, and they have Ashley Young and Anthony Martial, who have explosive pace. It would be a test of character for Arsenal, but I hope they could bring them down. COYG! VCC! Arsenal salvaged a point in Old Trafford despite in overall United dominated the game, especially in the first half, when the Gunners could not able to create single attempt at all. Arsenal were able to equalized, thanks to Tyler Blackett's own goal from Theo Walcott's cross. Arsenal remains on the 3rd place with 71 points from 36 games, while United stays on the 4th place with two points less but one game played more than Arsenal. Generally, Arsenal were being second best and United controlled the possession. The introduction of Walcott and Wilshere on the mid of the second half rejuvenated the Gunners' performance. Only after this substitution - with United looked tired as the game wore on - Arsenal looked threatening. Yet another unchanged line-up named by Wenger for this match: Ospina; Bellerin, Koscielny, Mertesacker, Monreal; Coquelin, Cazorla; Ramsey, Ozil, Alexis; Giroud. It has been the same for the recent weeks despite blip in Swansea. While I understand Wenger wants the first team to settle, I would say changing one or two players per game would not do harm. Not changing the line-up could potentially give the sense of safety of the starters, giving them complacency and I think this might be the reason on the decline of the performance on the last two matches. If they know their place in the starting line-up is not safe, they would fight more for it instead of feeling safe because the manager keeps playing same team. Rotation could help Arsenal to prevent injury as well as to help the jaded players. Cazorla could do good with having one game off as he is one of the most played midfield this season, and so could Alexis. David Ospina is a good keeper, but I feel on the last two games he could do better. Szczesny did make mistake on the earlier of the season, but I think we could give him more chance. He has a faster reflex compared to Ospina and with a taller height, he has a longer reach. I feel he could have prevented Gomis' goal last week and also Herrera's shot today. Aaron Ramsey has been deployed in the right side of midfield for the last six games, and he already expressed that he would prefer to play centrally. This match showed clearly that he is more dangerous from the middle rather than playing from the wing. After Walcott and Wilshere coming in for Bellerin and Cazorla. Ramsey and Wilshere played in the middle and the flow of the game getting better. Last season, Ramsey was our best player and he was doing that from the middle. I would say we could afford to rotate Santi Cazorla - who looked very ineffective - in the middle of the park and give Ramsey the game from his preferred position. From that position he influenced the game more and started the equalizer from his long range pass to Walcott. He was also involved in at least three attacks on the final 15 minutes when he plays from the middle, while he was struggling to make impacts from the right flank. Maybe Thierry Henry is right, this team needs few players to win the title. Olivier Giroud might be banging goals few weeks back but he looks short of ideas in the recent weeks. Now I might agree with Thierry Henry about additional striker Arsenal need before they can challenge for the highest prize. Giroud is not a bad player, but he is a very static striker. His movement is not the best, especially because his pace could not help him. There were some occasion where there was a lot of spaces behind United defender and David da Gea, but then we could not sent a decent through pass to Giroud because he was too slow to race with the defender. He would be useful to break the deadlock against the team defending very deep as he provides decent flick. But he could do better in his final touch as he wasted at least two golden chances today. A pacy striker who has a great touch would be useful for us in the team. He could complement Giroud, or in the other tactics, he could be upfront alone. Another thing is consistency. He could hit the best form in five games before switched off for the next few games. That what happened this season and last season. Ashley Young run rampant from the left flank, leaving Bellerin exposed due to his inexperience. He has done quite well this season, but seeing him run ragged by Young showed that his inexperience in the big match. Mathieu Debuchy has a better defending compared to the Spaniard, but Bellerin is still 20 years old and there is still more from him. He could do better in defending, especially against tricky winger like Young. To sum up, this crucial one point through a lucky game made us could comfortably finish third, but there is room for improvement in the next game. PS: Sorry for not writing for a long time. Gonna try to be more consistent with writing. How the hell is Arsenal losing the lead twice in a week? Enough with excuses of they scoring from the spot, disallowed goal, or lacking of the defender. Last time against Anderlecht, we surrendered THREE goals lead to draw 3-3. Today we surrendered one goal to lost 1-2. Something is wrong with this team, or at least how this team should defend. Okay, basically we are back to three years ago where we always conceded a soft goal. In my opinion, some of the goals are preventable, and happened because of our own mistakes. Sigurdsson's goal was great and there's nothing to complain about it but Gomis' goal was our own mistake. Chambers has a bad game so far, being bullied again and again by Montero, yet Wenger did not do anything with it. Chambers is not an explosive fullback so he is exposed easily by pacey winger like Montero. We have a quick defender in the name of Hector Bellerin on the bench, but Wenger keep playing Chambers. You can change our right back with Hector Bellerin and shifted Chambers to the middle so that we play 5-4-1 to grind to our lead. I know it is good to believe in our players to show their potential, but how much points we can afford to drop in sake of "developing players"? Nacho Monreal might be faulted at the goal, but he ain't a central defender who is aerially strong. He is left back in the first place and never played centrally. The criticism for him is unfair when your manager played you out of position. Wenger also looked static - as always - with his tactical plan. He never had a plan B on his mind. Look at Gary Monk today. He see Arsenal completely nullify Bony and Emnes, and he reacted to bring in Modou Barrow and Bafetimbi Gomis, who directly responsible for two of Swansea's goal. Barrow was fouled for Sigurdsson's freekick and Gomis scored the winning goal. Yes, Wenger might have it done with Anderlecht away win as Podolski scored the winner, but that was a rare example where our substition changes the game. Wenger might have make Arsenal bigger, but he is ain't Arsenal. He might be a good motivator, but he is not a tactician. He had last year without certain restriction on budget and another good money this year. No excuses on selling our best players any more. Aaron Ramsey was another anomaly in this game. Looked like our Saviour last season but this season he did a Bendtner, failed to impress everytime called upon. I didn't know whether this correlates with the injury he had but he looks out-of-form, and Wenger should do something about it. The Welshman seems to be obsessed with scoring goals or making overly-complicated goals. Back to basic please, that's how the midfielder should be. Wilshere was pretty good recently before he was out of the team due to suspension and injury, and I think he should enter the pitch next match in expense of Ramsey. Still, give him like 20 minutes each game so that he can regain his form again. Conclusion: I felt disappointed, frustrated, and angry with the results. Enough with all the excuses. Scoring from the spot? Do a better defending, try not to do a rough challenge on the box. Lack of defender? It's Wenger's fault not to bring more defender on the transfer windows. Our defensive performance has been abysmal recently. To be honest, with this kind of performance, we are going to be raped by Falcao, Di Maria, and that certain traitor. Well, I do hope Wenger could prove me wrong. PS: I still support Arsenal, it's just I need to express my frustration and anger towards the game. Arsenal eased to a 3-0 victory in Villa Park despite a first half-hour struggle against lively Aston Villa. Mesut Ozil opened the scoreline after receiving a sublime through pass by Danny Welbeck and coolly slotted past Brad Guzan. One minute later, Ozil's cross found Danny Welbeck, who applied a simple finish and registered his first goal for the Gunners. Shortly after, Kieran Gibbs' cross forced Aly Cissokho to beat Brad Guzan and gifted Arsenal the third goal. Three goals in three minutes destroyed Aston Villa's confidence and let Arsenal to dominate completely the game. There are few take outs from this game. Finally Arsene Wenger decided to revert to 4-2-3-1 after a bad game against Dortmund with 4-1-4-1 formation. The change of formation accommodated Ozil back to his favourite position in the number 10 role behind the striker. The German looked very comfortable playing there, linking up with Danny Welbeck very well, as both exchanges assist to one another in this game. Hope this kind of performance can give Ozil more confidence. He has been criticized very heavily in the recent times and I believe he can be great in the correct formation and position. He's definitely not a winger because it gave him more responsibility to track back and he ain't that good in defending. Should Ozil come back to his best, it would be more fascinating to see more Ozil's exquisite passes in the coming week, especially with likes of Welbeck, Chamberlain, Campbell, and Alexis on the wing or upfront. I believe a good team would start at the back, though Arsenal in 2004 didn't have that concept in mind. Last season, Arsenal were fairly solid at the back at most of the time, except when they choked in away games against big team. However, this season they looked a bit shaky in each games, especially in set pieces. This is also might be caused by injury of Giroud, who often goes back to help defending set pieces. We now only have one towering player in the Per Mertesacker. Disregard today's scoreline first and you can see in the first 20 minutes, Aston Villa were getting chances by chances. Ciaran Clark could've easily opened the score when Arsenal went sleeping on defending Tom Cleverley's free kick. Lucky, Wojciech Szczesny were brilliant, throwing his body to deny it. Alan Hutton got a free header on near post which was - luckily - over the bar. Laurent Koscielny was much improved from his three poor display against Leicester, City, and Dortmund respectively. The shaky defence might be also caused by the changes in the back four. For the last three games, Wenger always play different player in the back four due to various reason. After the first team back four is somewhat settled, there are possibility they would be more solid. He hasn't been hitting his best performance this season, but today was his worst form in this season, or even for the past 2 years. I haven't seen Ramsey this frustrating for long time. He misplaced few numbers of passes, and even made a simple pass to a corner for the opposition. He gave a balance when he play deep like today, but it might be a good idea to rest him for a while in the coming weeks, especially Wilshere now is playing quite well and can fill in the gap if Ramsey is rested. Summary: This might sounds a bit pessimistic but those are three things I would like to highlight. There were a lot of positives, mostly because the shift of formation and Ozil back to his natural position. I was hoping Wenger rested Ozil today but it seems that Arsene want the German to have more time in pitch to regain his confidence. Hope Arsenal can bring today's good performance to the next game agains Southampton in Capital One Cup and more importantly, the North London Derby against Sp*rs next week. Arsenal somehow 'escaped' the game with a point after a 2-2 draw with Manchester City. The Gunners look to set to register a win before Manchester City equalized through Demichelis and collapsed towards the end of the game as City created at least 3 great chances that fortunately none of them converted to a goal. Thanks to the goalpost which saved Arsenal twice, Arsenal got draw on their own turf. The first half was a typical Arsenal performance: dominated the game, nearly scored a goal, then conceded. This goal was partially Flamini's fault who failed to see Aguero running behind him. Before the goal, Arsenal could've taken the lead had Danny Welbeck's shot not denied by the pole. However, after the goal, Arsenal lost dominance and City comfortably controlled the game, leaving Arsenal disjointed. On the second half, it was not better until Jack Wilshere's awesome skill dribbled past Clichy and lobbed Joe Hart to equalize. Arsenal overtook the lead when Wilshere's header volleyed home by Alexis Sanchez. However, City's substitute Kolarov sent a marvellous corner to Martin Demichelis, whose free header beat Szczesny. There are few positives from this game, like Alexis Sanchez' work rate and Wilshere's majestic performance on the second half, but the worries overshadowed the good take-off from this game. Another bad effects of 4-1-4-1 is the gap between the attack and the midfield. Danny Welbeck looks so isolated upfront and looks bad - except during the first 15 minutes - on his début. Looks like Wenger utilized 4-1-4-1 to give place for Ramsey and Wilshere in the team, but that does not make sense to sacrifice the team to accommodate them in the lineup. Second worrying thing is about the injury. Debuchy looked very bad on his injury after twisting his ankle nearing end of the game. Chambers is more than capable to deputize him but now Arsenal only have 5 senior defenders. It's still September and Arsenal looks very short at the back. This could cost some important points here. For now, it's a bit hard to imagine our team to sit at the top at the end of season with this kind of performance. Wenger's stubborness might cost us the chance. 4-1-4-1 does not work well, and other formation might suit the Gunners better. Still, I'm hoping for improvement next match. Post Match Thought on Everton vs Arsenal. Arsenal grabbed a hard-earned point in the Goodison Park after they scored two late goals via Aaron Ramsey and Olivier Giroud. Everton, for most of the time, was the better of the two teams, but two decisive moments changed the game, especially after Arsene Wenger introduced Santi Cazorla and Joel Campbell in expense of Jack Wilshere and Alex Oxlade-Chamberlain. Few take outs from the game. 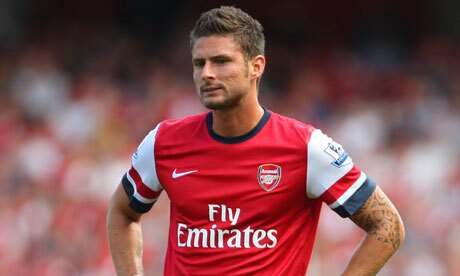 Like it or not, Arsenal's current system need Olivier Giroud, or at least a support striker. With Alexis playing upfront in the first half, Arsenal can't really build up the play, as no one waiting in the box to receive the ball. As Everton played tightly at the back, Alexis was forced to drop very deep, leaving empty space on the box, thus every time Arsenal got a decent position on the flanks, they have no one to aim for. It was an easy job for Everton to defend from that kind of attacks. This is however, changed with the presence of Giroud. A pivotal target man, who even like to drop deep, he tends to wait in the box. This unsettled Everton's defence, especially after the introduction of Cazorla and Joel Campbell. Two of the goals for Arsenal came from the crossing and it's no coincidence that the goals came after his introduction. I'm not saying we don't need more striker. Giroud is a great striker at its best but he often had a day off, while Sanogo is too raw. An addition striker is welcomed but I feel like we need a quality defensive midfielder who can play as a defender more than a striker. I feel strange that Wenger keeps playing Jack Wilshere in the starting line-up despite not playing well recently. Despite playing well in the Community Shield, Jack lost his form on his last three games. Seeing how we play better with Cazorla on the hole, Wenger might want to think to sacrifice the Jack for Santi, even though he's a bit inconsistent. Though I hope Wilshere can do a Ramsey after discovering a great form through serial of criticism in the first team. In addition, I see Ozil wasn't really comfortable playing down the left wing today. It's true that he was played on the same position in German National Team and he likes to run through flanks when he is played on the hole. However, playing on the wing gave you extra responsibility to track back the winger, and in this game Ozil lost the plot when he let Coleman took the cross that lead to the opening goal. I hope Wenger would put Ozil back to the number 10 role, and give him the freedom he would like to have. I don't want to see Ozil doing an Arshavin who was forced to played out wide and lost his confidence and touch. It was another inconsistency shown by the squad as they crumbled on Everton's fluid attack on the first half and could've scored more than two goals, but lucky they didn't. It was not only about the team or the strategies, but also the individuals that plays for the team. Each of them can play really well in one game but invisible for the next game. Giroud, Sanogo, Cazorla, Wilshere. These are at least four names I remember playing well in one game and disappears in the next game, or vice versa. This is a vital area Arsene Wenger must think of how to solve as this would be the most critical issues to win the League.